How do you store your embroidery threads? This question has troubled me for a while. 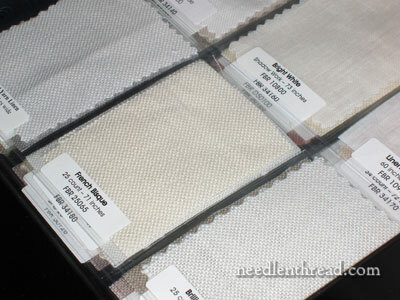 Over time, I’ve been investing in complete ranges of threads that I know I will be using in my hand embroidery projects. There are obvious reasons to have the whole set of any given line of thread on hand, the primary one being that threads are to the embroiderer what paints, pencils, pens, or crayons are to the artist. If you don’t have just the color you need or you don’t know just what colors are available, then the designing stage becomes decidedly more difficult. Of course, the artist can mix paints, and to a degree, we can do that with threads, but not in quite the same way, right? Real thread cards are a partial solution to this, but not an entire solution. On a real thread card, you can see a real piece of each color of thread in a range of embroidery thread. The drawbacks? One, you can’t stitch with the thread sample. If you have the whole skein or spool, you can actually stitch with the thread and see how it looks in the overall design. Two, not every thread line has a real color card, so you have to make your own, which requires you to have the whole range of threads, anyway. 3. Aesthetic Appeal – while the storage solution didn’t have to be beautiful, I didn’t want it to be ugly. It at least had to be neat and clean looking. This is my embroidery thread storage solution. These cabinets are made by Bisley. They are made out of steel and are “collector’s cabinets” – made to hold collections of things over time, in an environment that is not harmful for whatever is stored in them, be it paper, thread, or other precious collectibles. I began my search considering archival paper storage, and the first thing that came to mind were flat files used for documents, blueprints and the like. Flat files seemed a great idea for thread, too, because you can easily see the thread laid out, not piled in heaps that needs must be dug through. But your typical flat files for documents and blueprints are not only large, but even when bought second-hand, are also very expensive. The large size made them impossible for me, because I don’t have space for large furniture. The expense – well, I knew I would have to spend money to achieve a workable storage solution, but I didn’t want to spend that much money! The Bisley cabinets are not inexpensive, it’s true. But they fit in every respect what I was looking for, so I was willing to make the investment. I bought the cabinets through The Container Store, which, aside from going through the manufacturer, is the only way to get them in the US. I called the manufacturer to compare options: would it be cheaper to buy through Bisley directly, or through The Container Store? The upshot was that the the freight shipping used by the manufacturer would increase the cost of the cabinets, compared to buying them through The Container Store. So… off I went to The Container Store website. Wouldn’t it be nice if there were a Container Store within driving distance, so I could save on shipping? Not quite so lucky! But – low and behold – the cabinets were on sale, and they were on sale for about $70 less per 10-drawer cabinet, which was just sheer luck. The sale’s over, but it’s definitely worth keeping an eye out for future sales. You can also sign up for their e-mail newsletter and the next day, you’ll receive a 10% off coupon in your inbox, which ended up covering shipping costs on these. To organize each whole thread set, I’ve arranged them not by color and shade groups, but by number. Most thread manufacturers keep their shades of one color within a certain number range, anyway (at least to a degree), so instead of working out color families and shade groups, I laid out the threads in rows by number. Au Ver a Soie’s spooled threads fit almost perfectly four across in the drawers, and each drawer easily holds a whole set of Soie Ovale or Soie de Paris. To keep the spools in line, I’ll insert thin barriers of card, cut to fit the length of the drawer. You can actually buy insert trays made for these drawers, but the insert trays take up precious space (and they cost way too much for what they are). Next time I’m at a framer’s, I’ll pick up a sheet of archival quality card or mat board, and I’ll slice thin strips that will divide my rows of spools. One 10-drawer cabinet is devoted, then, to three sets of Au Ver a Soie threads: Soie d’Alger, Soie Ovale, and Soie de Paris. I may condense those a little bit to free up at least a drawer or two for other threads. In the small middle cabinet, the first drawer is dedicated to fabric swatches and thread inventory lists, and the other drawers will be devoted to more thread. You can see that the cabinets have a place for labeling. The number range for the thread in each drawer is written on the label. You might have noticed that the interior of the drawers is black. If you prefer to see your threads against white, you can always line the drawer with white acid-free tissue paper. The drawers, by the way, pull out so that you can take the drawers to your workstation and then put them back easily. And so much for laying out the threads so I can see them clearly! I ran out of room, so my complete sets of floche and coton a broder are stored like this for now. Eventually I will invest in a few more cabinets. The 10-drawer cabinets are small enough to sit on top of a table, if you can handle having something “towering” on the table. They are not tall enough to stretch a board over to make a desk, unless you invest in the super-high plinths, which must be purchased through the manufacturer (Bisley). My plan is eventually to do this with at least one set of cabinets, to create a permanent light table tracing station. The Container Store carries regular plinths, but these are four inches short of the normal height of a desk. Right now, the cabinets are sitting atop a table, but they are also short enough to sit under a table, which is where I’m going to put them for now. The five-drawer cabinet sits comfortably on top of a table. So, my thread storage is developing a little bit at a time, as I can afford to invest in the cabinets. I’m also keeping an eagle eye on The Container Store website, to see if the cabinets surface in a sale again. 1. They’re safe, a perfect environment for storing thread long-term. 2. 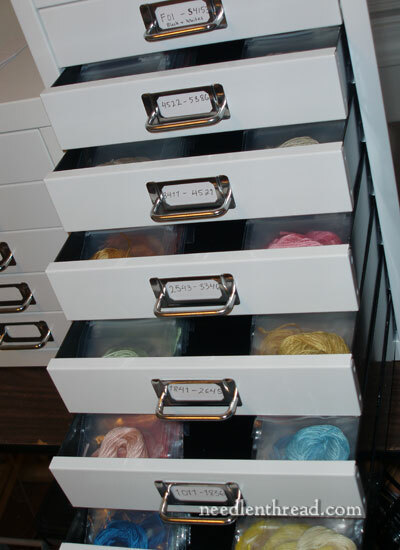 They offer flat drawers, so that skeins and spools can be easily seen. 3. They come in manageable components that can be purchased over time and arranged in a variety of ways, reducing the need for large pieces of furniture. 4. They are extremely well-made and will last. 5. They are attractive. This is not necessarily essential, but I do prefer it when visible storage solutions are neat and attractive. 1. They are expensive. Look for them on sale! 2. Their extra components (plinths, divider trays) are also expensive. 3. They don’t come in a standard desk height. I would rather have a taller cabinet with more drawers than buy plinths to raise these up to desk height. 4. The insert trays made for the drawers take up way too much drawer space. They are not streamlined at all. Overall, I’m pleased with the cabinets. I like their look, I like their functionality, and I like the fact that they will keep my little threads safe and happy for a long time. Your turn: How do you store your threads? Have you found a manageable storage solution for large quantities of thread or whole thread sets? I’d love to hear your take on it! Feel free to leave a comment below! 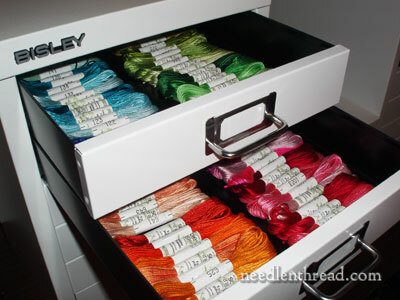 There is no affiliation between Needle ‘n Thread and The Container Store or Bisley. February 28, 2013 Embroidery Thread Organization… & Reminders! you are fantastic in may ways. I read every day your letters. And today I think that I will run to Container store and change ALLLLLL my threads. Thanks. Congratulations for your talent. Mary,I notice that these drawers are quite deep; how do you deal with that as you cannot see anything that in in an underneath layer, yet your threads seem to be laid out near the top of the drawer? a l m o s t deep enough, front to back, for a skein of DMC floss and hold , for me, one skein of about 8 colors in each drawer. They come as a set of 12 drawers, overall size about 9″ cube or as a double cube size with the center drawers double width. Very handy for balls of Perle etc. The advantage for me is that the front is clear and I can see the colors, even though i have the numbers marked on the drawer fronts. Hi Mary I went to Michaels Craft store and bought their Scrapbooking storage units they have worked out great for both my card stock and some drawers for my threads.And Michaels always seem to have them on sale for about 40 dollars up here less 20% sometimes so they are very reasonable. I use exactly the same thing! I just got a bunch more for about $17 each (40% off, then another 15% off – watch the coupons). They are in 14.25×14.25×14.25 inch cubes, and can be stacked any way. They are marvelous, and I have one wall of my studio lined with them. Right now I have stored my threads in a rather large metal tool box. I have lined it with felt and cotton fabric, and simply laid them out in color families. The third, and largest drawer in the tool box is kind if a mess, with embroidery floss I wound on floss cards.This system looks wonderful. WOW. I really like this idea. I have been using an Ikea shoe rack with drawers for storing my threads. I have to keep digging through each drawer for the exact thread I want (I keep a spreadsheet with each color so I know it is in that drawer). Like you, I don’t like the industrial look of most of the thread storage solutions out there. Thats a LOT of thread! I happened onto a second hand walnut office desk and credenza at a yard sale that I have in my craft room. The large drawers are for fabric and patterns and the small drawers are for thread and lace. Works pretty good for a low budget solution. I punc a hole in the corner of a baggie. I put the thread in a baggie by color then put the baggie into a large ring binder. I sort it in the binder by color groups. I can add or take out baggies as needed. This keeps the threads from making a rats nest also. I can keep little pieces of the thread left over with the original skeins and use them as needed. This seems to work for me so far. Like you I use bags, although I use floss-a-way bags. Then I store them in an acid free box in order of their numbers. That way I can pull them and place them on a ring for the project. Mine is not as elaborate as yours as I do not have enough room for that much floss and/or floss storage furniture. My storage is organized, and (mostly) second hand. The bulk of my uncarded, still in skein floss is in a large (18x10x10 ? never measured) accordian style, 4 level, Danish?, box with a basket style handle, (from the 40’s or 50’s I think) that my granma used before her arthritis got horrible when she was in her 60’s. She gave it to my mom, but she knits/crochets so had no use for it, so mom gave it to me. My carded, not in project floss is in a large (14x10x2 ?) compartmented tool container my dad no longer needed. Originally it was designed to hold large amounts of nuts and bolts I think, but my dad moved those to larger accomodations, so I washed it several times in HOT water and dish soap, then a soak in bleach to remove any oil or whatever and it was good to go. My carded, IN project floss is in one regular sized (11x7x2 ? ), compartmented floss box I bought at a craft store years ago. The project floss box is in the bottom of my project basket (12x10x7 ?) which has a deep (2in ?) tray insert in the top for all of my tools and so forth. My hoop and folded projects are in the bottom of the basket also, you know, a grab and go situation. Love your storage idea and if I could, it’s exactly what I would use. Unfortunately, their price puts them out of my budget. So instead, I’ve been using fishing plastic cases. I do have some silk threads and I’ve been keeping those in a paper bag for the time being. Maybe I’ll get lucky one day and be able to afford these wonderful metal cabinets. I have a small home and do my stitching right in my living room. I store all my DMC threads in floss-away bags and put the bags on a ring for use wifh a project. This works well for me but i needed a way to store the colors that were not being used and i wanted something i could put in my living room.. I finally found, on Amazon.com, a 24 drawer, CD storage cabinet manufactured by Lesli Dame. The drawers are approximately eight inches deep and are the right size to store the bags. The cabinet comes in different wood finishes and the drawer pulls have room for labels. I love that the bags are organized and I have a piece of furniture that looks nice for a reasonable price. I also use snack baggies for my threads, they are great when working on projects – I, too, punch a hole and put them on a ring. For storage, I keep the bags in archival photo boxes, I have two rows in each box. It works for me because I can fit them wherever. Your cabinets – well, of course I would love something like that! Oh my goodness!!!!! All those beautiful threads arranged so nicely! I’m afraid that my threads are stored in plastic containers at the moment. I’m building my collection and haven’t a need for cabinets yet, but as you say, these are our medium…just as a painter works with paint…,and therefore can be quite an investment. So I’m going to look for an alternative to plastic. Thanks once again for all your research and HELP!!!!! 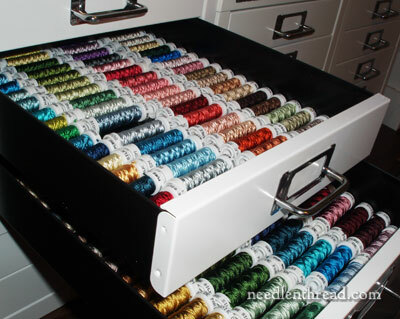 If I ever get to the point where I have that much thread (and become that organized), that’s a fabulous setup. i’m envious of your stash…lol. if i keep branching out into different threads like i’ve been doing, i’m going to need something similar. just hit the link you provided and, OMG, there’s a real live container store about a 20 min drive from my house….i’m definitely going to have to do a field trip, even if it’s only to drool. but then maybe if i start out with one of their small five drawer jobs, that should hold most of what i have now. My mouth is watering. That is an amazing set-up you have. I do have one question though: What do you do w/the threads you have opened and used some of. (Sorry to end a sentence w/a preposition.) Is that what the little bags of thread are? For years I have joked w/my husband, Roger, that I’m going to get myself one of those huge red/black tool storage cabinets you see in hardware stores. This is a much nicer arrangement. I’m at the begining stage of setting up my work room. Most of my threads are from Rainbow Gallery, which are on cards. I love your system. I do needlepoint and samplers on linen. I’m becoming interested in surface embroidery. How would my Rainbow Gallery cards work with the Bisley system? I love the storage I could use for the Krenik metallics. I need a fileing system for charts and another bookcase for my books. No solutions, but help wanted. You can always lay out the RG threads on rows, I think. You might consider making dividers between the rows, to help keep the lines straight and neat. I see some plastic bags; are those a certain kind (ie archival)? Hi, Joey – those are threads I use regularly, so they aren’t really set up for long term storage. I don’t know if the bags are archival quality or not – that’s how they came from the manufacturer. That’s a second set of Soie d’Alger for stitching with. They’re not skeined up, but the bags are labeled with the numbers, do I can find colors easily. I have 2 large tackle boxes, one for cotton threads and one for silk, gold and specialty threads. I like that they are portable. I don’t have as much thread as Mary does, though. Dmc’s, are stored in zip lock baggies, spools of metalics in metal boxes that stack together, gift of a friend. The few silks in a mahogany box. I love these — what a find you made! You mention that the shorter plinth at the CS made them too short for a desk, but what about a double-decker desktop, bringing the top level to normal and having your light tracing function built into it (with the lights etc in the space between the two levels)? My engineer brain is having fun with this. How deep are they? Deep enough for a workable desk area? Off to the CS so I can see! Oh my, oh my – this is organization in its essense… I’m speechless. Really. Yesterday I blogged about my recent purchase of Appleton wools – the amount of it and where to put it – but I have to admit that my stash of wools are tiny, tiny compared to this heaven of threads. I doubt that I’ll ever get this organized but I will definately start looking for some kind of metal container/drawer thing on a smaller scale. Thanks for sharing this with us, Mary. I love seeing and hearing about what other folks do to store their thread. I have tried many things and have a variety of things going on now, but have been saving up for drawers ever since I heard Trish Burr say that she uses that system. I didn’t even know this type of system existed and never considered the possibility an archival quality storage system before. I took a notebook that zips closed and my husband’s baseball card holder and little zipper bags to create a portable workspace. I would love to send you photos to share. I wrote recently about this. I have one of these rescued from its fate in a dumpster during an office move. I use it for sewing threads and buttons. Not long ago Ikea had similar cabinets with slightly deeper drawers. I have all my DMC floss, floche, coton a broder, and Appleton wool in the floss bags in numerical order. This is not the best solution, but it works moderately well. I plan on putting the silk floss in bags as well. I like the bags because when I use the floss, it sometimes comes out of the skein (especially the silk) so I wind it around a paper bobbin. If I put these in drawers it would be a mess in no time at all. But the drawers look like a good idea for spooled threads. My beads are all in a jumble in a drawer, so are my needles. Another bad girl. Yes, the cabinets are very well made. The drawers don’t slide out like ball bearing drawers would, but they come out straight, very smoothly. The hardware is fine, though it isn’t what I’d call “heavy duty.” The whole feel of the cabinets is very solid. I think Bisley is pretty well known for quality cabinets. Measure the footprint of your cabinet and then figure out how much is lacking in height to make the table you want (let’s say it’s 8 inches, for example only). Split the difference (4 inches) and then head to your local lumber place. Many, especially those which cut wood for customers, have these great bins that are usually marked FIREWOOD, full of odds and ends–and some of those ends can be very useful indeed. Grab the friendliest clerk you can find, explain what you need and show ’em a diagram, then tell them what you have in mind–a few hunks of otherwise wasted wood which will support your cabinets and desktop. You’ll be amazed at what you find. I have a stack of blocks that range from the standard 4×4 to 6×12 inches, and 18″ long! Once you find your wood, give it a good sanding all over, then stain or paint according to what you want. Triangular-cut pieces (it’s amazing what some places will do for a small fee!) can be used to incline your work surface however much or little you wish. These cabinets have me daydreaming about bead/jewelry/general small craft storage! That’s a good idea! And much easier on the pocket book than the plinths. You’re right, I need an 8″ height to bring them up to desk height. I’ll look into something like that! Very nice cabinets. I never would have know about them if you hadn’t “found” them. One comment I have about thread storage — I have been known to use those “photo boxes” from the crafts stores (very inexpensive) — but to get rid of the “acid” issue – I also purchase a roll of aluminum foil and I line the boxes with it (including a piece to go on top of the filled box before putting the lid on). This blocks the acid in the cardboard from the threads. It isn’t a permanent solution — nor as elegant as your solution — but it does offer short-term storage safety for threads. Thanks for the tip, Bobbi! I’ve found acid free photo storage boxes, too, for a fairly good price, so I do use those for some threads right now, until I have enough cabinet space. Never thought of the aluminum foil! That’s an easy and cost effective solution. love your cabinets! ok..so i’m jealous, let’s just get it out there! Seriously, everything looks great, new and completely unused. I realize the spools keep well when some thread is removed, but how do you think it will be handled when you start using the threads, the paper labels are off, or there are a bunch of on one color, some taken out for another project. Misc. threads purchased just to try? Also, in the drawer with the little plastic bags, is that where you keep your misc. threads or was that special thread that comes in the bags. Hi, Chris – I’m pretty careful to keep the labels in tact. I do have a miscellaneous drawer of various threads that aren’t part of sets. The plastic bags are actually all a second set of Soie d’Alger, which I use for stitching. The whole set of Soie d’Alger on skeins are for color reference and matching. But if I do ever cut into them, I’ll replace the used skeins immediately, so I always have a full color set. That’s another reason for the steel drawer cabinets – the threads will maintain their color integrity, because they are not exposed to light, and they are safe from dust and other contamintes. Mary I envy your thread collection and your devotion to the preservation of materials. I dream someday of a sewing studio like yours. Thanks for insight into thread storage and your system. Your metal cabinets with drawers really seems to be the ultimate solution. Are the drawers lined with acid free paper or are the threads on the painted metal surface? I’ve been building a “new” thread stash after my previous start of about 200 DMC threads was subject to mould. My house suffered water damage and the floor of the room were my craft items were stored was flooded for over two weeks while I was away. When I returned home the sight of it was heart breaking. The walls, ceiling and curtains and everything in the room had surface mould. Most items had to be thrown away. It took ages and many goes to clean the room and several years later there is still a hint of that distinctive odour. At the time of the flooding, my threads were “safely” stored in a paper bag with other craft items in a large sturdy cardboard box. The outside of the box was exposed to the moldy air but didn’t actually get wet. I transferred the items to a new clean box. I still have the threads but I’m reluctant to use them. They are probably OK but with the time and effort and other expenses that go into embroidery I wonder if I should just discard them or if there’s some solution I could wash them in to make sure that they are OK. What do you think Mary? Hi, Louisa – I’m not sure… I think it would depend on the smell of the threads. I haven’t had much experience with that kind of damage. I wonder if anyone else would have some input? Mary, I must say you are spoiling me. I really love to see all your super informative posts. And always think, why not I own one for myself. Even though I could afford, still expensive to invest on something which I do for my pleasure. And for those in US it is much easier to acquire things, than rest of the word. I am already buying a Needlework system 4 stand where I pay $56 for shipment 🙁 Can you also share with us your knowledge on magnifying lamps. There is emphasis on using the lamps. But much expecting the topic on “This Encyclopedia” ! Store my threads in my mother’s antique sewing cabinet. It has 4 drawers anad not quite waist high. I do like yours, however, would have to make it higher for me- not tall, but looks low to me. That is an eye-poppingly gorgeous selection of threads and the way they are stored is magnificent. I’m sure every embroiderer out there in internet land is drooling (as am I!). Wow – you are soooo organized! My storage consists of several sewing baskets (one of which was my great grandmother’s) full of wads of thread. No wonder I can’t find anything!! Dear Mary, in one word … this is a dream come true! These are really nice. Way out of my budget, however. I have various drawers fro my threads, depending on what kind of thread. 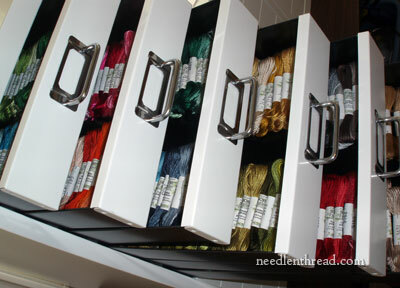 Most of the hand embroidery thread is in plastic drawer cabinets. Hopefully, I’ll use it up before I’ve had it long enough for the plastic to be a problem. I like that I can see the colors without opening the drawer. Wow – this is so inspiring. Makes me want to go shopping! Here’s my question. How do you continue to store the threads after you have used them? With spools, the threads remain on the spool, but with the skeins, how do you handle the storage once some of the thread has been used? Will you store it differently? Or will you continue to keep like threads together? Will you wrap the thread around something or keep it in the same general shape as purchased (I am thinking about the threads that are laid out with the little paper wraps, ie DMC.) This is where I generally get tripped up. I use some of the thread and then I don’t have a very good system in place to store the remaining thread in a neat and organized way. This is perfect! I am so glad I went to your site today – I’ve been thinking about my Kreinik threads and the Rainbow Gallery HiLights as well. Would you lay the Kreiniks on the side like you do with the AVS? The only problem I see doing it that way, is that you can’t see the numbers of the K’s. Rainbow Gallery I suspect, won’t be as bad, but I wanted to know what you thought. I was drooling on the blasted keyboard when I saw you pics of the threads all sweetly line up! I am sooo jealous! Now, I am going over to see these babies that you have, and drool over there! Hi, Tania – I keep the whole sets of threads updated with full skeins, because the only way you can actually be assured of ordering the right threads when you have to buy online is by having the real threads to see. Online pictures rarely display the right colors. When I use a skein, I keep the number tag on it and only cut what I’m using from the skein. When the skein is almost gone, I replace it. My thread (all C&C and DMC cotton, thus far) is stored in a couple plastic shoeboxes from Home Depot, fabrics are in Rubbermaid tubs. Not organized. However, I have Plans. When we set up our leatherwork shop, the credit bureau across the street from where I worked was moving, and had for sale 4 used, ancient steel index-card files. They have the height and footprint of a standard office file cabinet, so space may be an issue for some! We’re downsizing the leatherwork, so I hope to snag one of these cabinets for my needlework supplies. The drawers are about 4″ deep and have built-in, removable steel dividers, so at least a few drawers can be reconfigured for flat-fold fabric; the rest for threads & tools. They only cost us about $50 each but obviously arent available everywhere! Oh, and they’re fireproof so they are HEAVY – takes both of us to move one. I, too, spend a lot of time searching for suitable storage for my threads. It’s a nightmare! Au ver a soie are all in a large, plastic container with lid so I can see them; gold threads are in a HUGE chocolate box, wrapped in tissue, and DMC are in numerical order, stuck on strips of masking tape in colour ranges! I’ll look out for your steel drawers. I pulled out the crystal bowls and wide vases from my china cabinet to keep my limited, silk, Kreinik, Rainbow and specialty threads in. Wow Mary! i went to the container store yesterday. oh i wish you could actually visit one of those stores…..incredible. i could wander for hours just looking at all the goodies….i checked out the cabinets you purchased and they are extremely nice as you said. i want one…lol….even more than i did when i saw the pics. i talked to a young lady employee and she said they usually go on sale once a year and usually in january. that should give me some time to save some quarters and maybe get one of the little five drawer one next year. 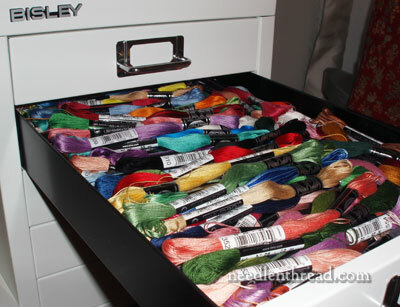 of course i don’t have the same volume of thread stash you do but i could fill one of the little five drawer units up….lol…and given enough time could probably fill up another one…lol. i was surprised at how small they were, not that it is bad, it’s just that one could easily place one on the corner ofa desk which would be a plus. i believe i could actualy fit one on my sideboard/hutch in the family room where i do all my stitching….lol!! WOW! I was blown away by the great storage space for threads. I live in a mobile home and I am sorely limited on space. I do not store my threads on cards but I do store them on bows. Works for me but nowhere as nice as yours. Would love to see more pictures of your studio. i spend a lot of time, and sometimes money, in a container store in illinois. i purchased the deep blue 5-drawer cabinet because my office is orange. i don’t have threads in it…yet. i have pens in mine. i absolutely love my cabinet. i’ll have to look for them to be on sale. When a local fabric store went out of business quite awhile ago – I bought two of those beautiful wooden DMC drawer sets – which equal to 6 compartmentalized plastic front drawers with 12 little compartments each drawer. I have the threads grouped in the rainbow colorway – I have to admit – because I love to see the colors, I have them exposed to the light – in the corner adjacent to my window seat so that the sun doesn’t reach it directly. own treasure chest from Madeira. I keep my silk ribbons for embroidery in a big plastic storage handled container on the top shelf with the patterns and accessories beneath it. Of course, my sewing/machine embroidery threads are pegged on the walls and on revolving pegged holders. Did we ladies mention – we love color and thread? Thanks, Mary, for giving us a platform to really assess how blessed we are to be able to own all of the things that make us smile. I am the same way! I have to have my threads within in view. I use peg walls and metal rings to hang my flass – kind of like a mini- thread shop? These are nice cabinets, and like you, I also arrange things by color and type…but I have waaaay fewer skeins and kinds of thread. I went for years with some threads in this box and some in that and ‘oh darn, I KNOW I have that color…now where did I stash it?’…then I began labeling all my containers and boxes. I also scoured Craigslist and thrift stores until I found the right sets of drawers etc. Mary I am so impressed with your research, and the cabinets certainly look very neat and professional. I have a full set now of DMC threads and have wound the thread onto the spools and have then numbered them using the stick on numbering system you can buy. they are then filed according to number. Other threads silk etc. are kept in the same way; (don’t have a full set yet though I am so jealous of your stock). This is when it all falls apart now; I did not consider that storing them in plastic would be detrimental, maybe I won’t live long enough to worry, am 59 now. I don’t do the exquisite work that you do either, obviously if you are working on ecclesiastical garments these need to be long lasting. Do you need to keep some of the little sachets to absorb moisture with thread?? Thanks for sharing love it!! Are you storing your gold threads in these cabinets too. Are these cabinets on an outside wall? I have been told by several goldwork instructors to store gold threads, in acid free tissue, in the dark, on an interior wall. If not, what container do you use to store your gold. I have small boxes, baggies, hanks and spools of gold thread that I want to organize better. Any suggestions? MY friend made me a wood cabinet with draswers about the same hieght as your cabinet. the top drawer is about 5 inches high to accomedate my balls of thread and larger spools.The other drawers are about 3 inches high. I Love my cabinet it has 6 drawers. Which of the trays did you purchase to put you DMC floss in. Did you buy the 4 section one? Does only one tray fit in each drawer? I’d love to have these … and, perhaps even more, I would LOVE all the organizing/filling/labeling! Thank you so much, I have been looking for storage and love these. Have found similar but mostly in plastic. These are perfect! I live in a tiny apt and don’t have room for any sophisticated storage containers, though I love the cabinets you showed us today. I don’t have a large collection of threads, and they’re almost all DMC, wrapped around plastic bobbins and identified by number. I keep more expensive threads, which I have fewer of, in plastic bags by brand and color. What I use for storage is several DMC craft and thread boxes – they’re perfect for thread wrapped on a bobbin, but probably not big enough for balls of thread (eg, perle cotton). I use two large scrapbooking boxes – one for fabrics (in plastic bags, labeled with brand, count no., and size) and the other for patterns (which is rapidly filling up, now that I’ve started adding embroidery patterns to the cross-stitch patterns already there. I keep the tools and supplies I’m not using in plastic bags. The tools I do use regularly all fit into a hinged eyeglass case, which I keep with whatever project I’m currently working on. And I keep the few various projects I’m working on at the same time in those bags for gifts you buy at the drug store. Easy to carry. Oh, how I envy people who have a craft room! Who knows, someday. . .? What an organized person’s trip to heaven those are!!! Woo Hoo! I like those drawers. I live in South Africa may be I can trace them here too. Are they tall enough fro deskmheightnif you stack a 5 drawer atop a 10 drawer? I store my embroidery stuff in a small-ish sewing box. I’ve sorted some threads into the tray that sits on top, but keep the rest in envelopes according to color in the bottom. Since I don’t have too many colors thus far, this works for me at the moment. hi! i don’t see 5 drawer unit at container site. is it under ‘collections’ like the 10 drawer? they look great! When is an embroidery thread too old to use? I have some stranded embroidery threads that would be over 70 years old. Can I use it on stamped embroidery (several of) which are about the same vintage. If it’s silk, age is not so much a problem, if the threads are clean and free of mildew or anything like that. They won’t lose sheen or anything. Cotton loses its mercerization after so many years, but not necessarily if it hasn’t been used. Thanks Mary. I’m just not quite sure what losing mercerization means. Would the cotton threads tend to break once the embroidered piece is washed? I’m quite aware of the time and effort spent embroidering these vintage linens so if in doubt I would rather purchase new threads. Are you able to recommend any particular cotton thread suitable for doileys over 70 years old. The ones I have are Anchor, Semco and DMC. Mercerization is the shine on the thread. Cotton threads that are mercerized tend to dull a little over time. I’d test them forts for strength, and maybe clean them in a mild water bath. Check out this storage container from Fleet Farm. The height is just over 40 inches high so it might work as a tall craft table base. I absolutely love this setup you have going. The beauty of it is that it can be used for so many products. I am currently having a battle because I used the Bead Storage Solutions boxes (I absolutely love this modular system) for my extensive beading and jewellery work. I sort all my beads by colour and can reorganize them in a trice when I add or use up products, and the boxes get tossed, side on into a filing cabinet, (which is set up to form the desktop) but I am running out of room in the filing cabinet. My only problem is, I live in Australia and cannot find a similar product to the a Bisley product here. Shipping this across from the US or New Zealand would be quite expensive! I am however wondering, if the Bead Storage Solutions boxes would actually fit in these drawers? (According to my calculations they’d either just make it with a smidge to spare, or just be too big). Have you or anyone else you know of used these within the Bisley Drawers? 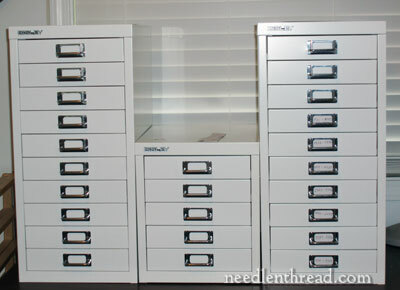 Thank you so much for all the info about the filing drawers for embroidery thread, and where I can purchase some of those cabinets. My threads are also just in a drawer, all mixed together and difficult to find. Thanks again. For your DMC threads, what are you using to seperate the rows of floss bags? Mine are slipping and sliding all over the place. Hi, Barb – I don’t really use floss bags, unless I have a partially used skein without the little labels on them anymore. I keep DMC in the drawers, arranged by color, so it’s just the skeins in the drawers and no bags. I keep partial skeins that are in bags in a separate box, and I use these when I’m demonstrating stitches or working up something small for tutorials and whatnot. Previous Previous post: Crewel Twists – Book Give-Away! Next Next post: Goldwork Embroidery: Never Ending, but So Worth It!